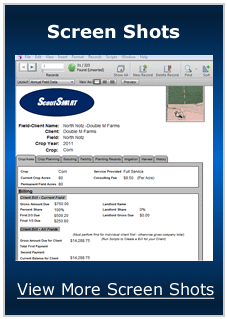 ScoutSMART is software developed for the crop consulting industry by practicing crop consultants. You will find ScoutSMART to be intuitive and easy to use. Work SMARTER, not longer. ScoutSMART will work for you throughout the calendar year. ScoutSMART is a great tool for crop planning, billing, soil fertility and fertilizer recommendations, hybrid and variety selection and the storage and analysis of historical crop records. When the crop scouting season starts ScoutSMART will really go to work and help you organize and report all of your daily activities including equipment calibration, plant population counts, weed, insect, and disease scouting, weather events, and pesticide recommendations. ScoutSMART creates professional field reports that are crisp, clean and informative. ScoutSMART thinks the way a crop consultant thinks. With ScoutSMART database software you will be able to create a field report much more quickly, accurately, and professionally. And with our customizable value lists and autofill features we can greatly reduce your keyboard time. Are you tired of flipping through a pile of field reports to find the piece of information that is critical to making a decision? ScoutSMART is built on the powerful and intuitive Filemaker Pro platform that allows you to search and sort your records quickly and easily. Put power to the data you collect every day. ScoutSMART does much more than create field reports and strives to meet all your crop consulting needs. ScoutSMART is capable of assisting in every task you tackle as a crop consultant through the calendar year including crop planning, billing, fertilizer recommendations, storing and analyzing historical records, equipment calibration, and the creation of professional field scouting reports. See our products page for more information about the software we offer. Intuitive and easy to use – thinks like a crop consultant thinks. Complete field reports quickly and accurately with autofill feature. Customize value lists for your needs and practices. Quickly and easily finds historical information – put power to the data you collect. Deployment using your computer hard drive or our cloud services - you choose what is best for your business. Creates professional appearing field reports that are crisp, clean, and easy to read. Field History section appears in every field report. Summary sheets for weekly pesticide recommendations for your grower. Increases efficiency for your crop consulting company. Improves communication with your clients. Puts the data you collect to work. A well maintained ScoutSMART database adds value to your business. Improves the implementation rate of your recommendations. Auto fill feature helps to eliminate mistakes and reduces keyboard time. Summarizes key agronomic information for your clients.